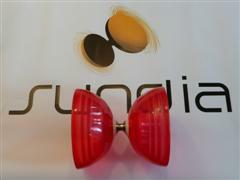 Sundia Evolution Diabolo G3 (Fixed Axle) Soft Cup version. We also have the G3 available in the Normal Cup version. The G3 Soft model features transparent cups made from a special version of the Sun diabolo material which has been formulated to make the cups much softer and squashy than normal. The material is very durable and has a much more rubbery feel than usual Sundia cups. This also makes the diabolo feel slightly heavier with more weight emphasis at the rim for better low speed stability. The transparent cup colours show up really well with Sundia''s white LED lights fitted.